It is a fairly short drive from London to Pearson or Hamilton so awareness is important. The meeting minutes from the March 5th Consultative Committee are now available on the YYJ website. Helps to explain the various expansion diagrams on the powerpoint that was previously posted and goes into a bit of detail of the timeline of future expansion projects. This summer they will be lengthening taxiway echo which will decrease taxi time (currently some aircraft have to taxi down then turn around). And looks like next year they'll begin work on expanding the apron on the west side of the terminal and adding 2 additional jet bridges on the upper floor. Edited by Kilo95, 14 April 2019 - 04:14 PM. Seems odd that they would want to add jet bridges when 1/2 half of the users (Delta and United) are leaving. Delta and United certainly didn't make up half of the aircraft movements. I'm not even sure that the UA CRJ used a jet bridge. Edited by vortoozo, 15 April 2019 - 12:02 PM. Yep, UA never (or at least very, very rarely) used a bridge. It looks like a 600' addition to the western end of runway 09-27 is now the plan in lieu of a 1,455 foot extension (shared between both ends). 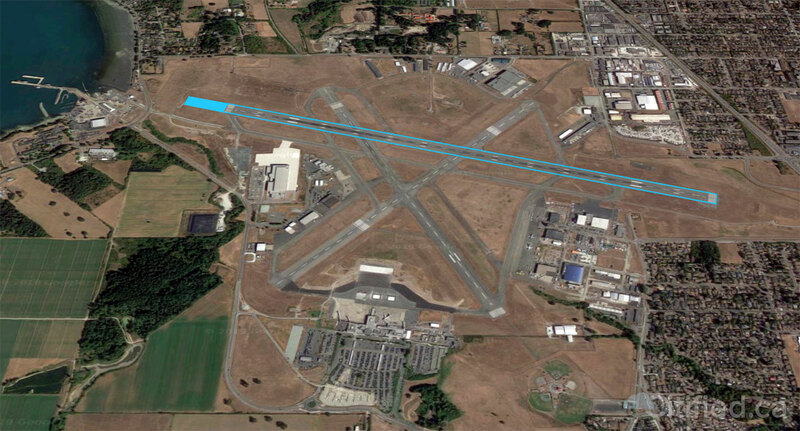 Identified in blue is a 600 foot extension to the western end of runway 09-27, the longest runway at Victoria International Airport. Although shorter than the initially planned sub-1,500 foot extension announced a decade ago, the scaled down plan is more practical, according to the airport authority's board, which cites advancement in aircraft technology as permitting shorter runways for larger aircraft. Traffic volumes are down in March over last year by 0.6% to 163,795 compared to 164,751. Thus far in 2019 every month has seen fewer passenger than the same period last year, with a cumulative reduction in passengers of 2.0%, or 8,806. Easter weekend straddled March & April last year - that may have something to do with the drop of 1000 passengers at least in March. Plus one would assume that United was a good chunk of that, with 50 arriving and 50 departing seats available per day last year. Will be interesting to see how this years total passenger numbers compare to last year, with United/Flair/Delta (in the Fall) all gone this year. i want to know more about these powerful new planes that can take off with loads of fuel on a shortish runway. aerodynamics have not changed much. a plane weighing x amount still needs a speed of y to get off the ground in z number of feet. i will allow that some engines are stronger now to propel that plane closer to y amount of speed faster (shorter). Edited by Victoria Watcher, 15 April 2019 - 06:11 PM. Thanks for posting that, interesting read. I have a far less grandiose request for the VAA than a runway extension, but something interestingly I heard several other people verbalize when I was out there last week to pick up friends coming in from YVR. When every other airport in 2019 has large easy to read plasma Arrival-Departure screens seemingly mounted every ten feet no matter where you are, I'm unclear why YYJ cheaps out and provides only 4 crappy little screens in the "Arrivals" rotunda area; as it was busy the night I showed up and their plane delayed I wound sitting at the back of that area, farthest from the screens as it happened. Since I don't have Superman or Optimus Prime-like telescopic vision periodically I - and then I noticed others too - would be compelled to get up and walk across the rotunda area so we could read the flight information. More, and bigger, screens would be a minor but welcome upgrade. A Dreamliner and an A350 could theoretically both fly from Victoria to London. They have a range that far surpasses the fuel requirement from YYJ-Heathrow. Fully loaded they require a minimum of 8,500 feet, but with ~60% max fuel load 7,600 feet should be ok. Older aircraft, like the 767-300ER that flies out of YYJ to Toronto, would require a full fuel load to make it to Heathrow and that would be too heavy for anything below 9,000 feet. Flair Airlines released its latest summer schedule, Thursday, revealing new routes between Calgary and Vancouver and Toronto, and bringing into sharper relief the competition setting up between Canada’s two ultra low-cost airlines. In its posted schedule, Flair plans 136 flights the week of July 1, to eight cities, all in Canada. That represents a decline from the airline’s launch in the summer of 2018, though as the airline adds larger Boeing 737-800 aircraft, capacity will be similar system-wide. Flair had announced plans to return to Victoria, British Columbia this summer, though the city has since been dropped. Yes, they nixed YYJ a few weeks back. News to me, I missed that but just read it now.....hmmmmmm.